The global image detection sensor market has been envisaged to be distinctly competitive and consolidated as being occupied by a mammoth pool of industry players. Transparency Market Research (TMR) has pointed out the over 70.00% share accounted by top four companies, viz. Texas Instruments Inc., Emerson Electric Co., Cognex, and FLIR Systems, in 2015. The nature of the competitive landscape has been foreseen to stay the same in the coming years with a lower range of new entrants showing up in the market. A report by TMR has talked about more factors which could influence the competition in the market. The global image detection sensor market, as foretold by TMR, could rise at a 9.60% CAGR between 2016 and 2024, taking cue from its US$9.67 bn revenue earned in 2015. By the end of 2024, the market has been envisioned to earn up to a US$22.01 bn. By technology, complementary metal-oxide-semiconductor (CMOS) could take a dominant position in the market until the end of the forecast period. By region, Asia Pacific has been forecast to lead the market, considering its over 35.00% share achieved in 2015. 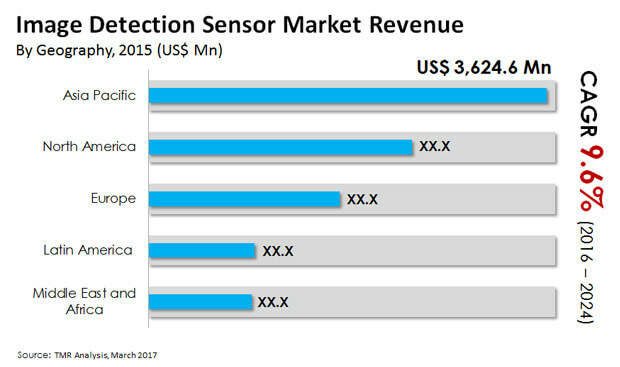 The increasing applications in end-use industries such as healthcare, consumer electronics, and automotive have been anticipated to set the tone for a consistent growth in the world image detection sensor market. A substantial boost in the demand for image detection sensor could be expected by players operating in the market on account of a broad technological development witnessed in the industry. In the recent years, technologies such as charge-coupled device (CCD) and CMOS have found extensive applications in lighting solutions, tablet displays, rear and front mobile cameras, point-and-shoot cameras, and personal computer (PC) cameras. Over the course of the next few years, the world image detection sensor market has been predicted to see a strong growth because of the cost-efficient use of the technologies. Besides this, the consumer electronics industry making available wide-ranging applications of image detection sensor for photography could create ample of opportunities in the market. The international image detection sensor market has been expected to face challenges in the near future due to the rising price sensitivity of consumer products and dwindling demand for still cameras. However, the growing applications of image detection sensor in other industries such as aerospace and defense and automobiles could help the market to sustain its growth. The aerospace and defense industry in particular has been testifying about the rising application of thermal sensors. Furthermore, the growing applications of CMOS sensors in smartphone cameras on account of their relatively low price and the practice of single chip integration have been expected to increase the growth of the international image detection sensor market. Low power dissipation and other advantages of CMOS could be another factor augmenting the demand in the market. Moreover, the rising awareness about these advantages has been anticipated to further increase the demand. More opportunities could be expected to come by with the growing industrial usage of infrared cameras.